As a native New Yorker, I hear the word “touristy” and cringe, so after checking out the mixed bag that is Yelp, I had my reservations (see what I did there?) about dining at Oh! Mexico. Here’s why I gave it a chance. In Miami, I am kind of a tourist, even though I’ve circled Lincoln Road several times in my short life. I’ve also had my fair share of unimpressive Mexican in my native New York City, and honestly, nothing could have been worse than the “nachos” we had the day before at our hotel pool, served with a side of bitter store-bought salsa in a plastic cup. The eatery on the corner of Española Way is incredibly charming both inside and out. The outdoor seating is the obvious choice, though, peppered with art-deco buildings in pastel hues. The interior dining room is also pleasant, and features giant portraits of famed Mexican artists Diego Rivera and Frida Kahlo along with blown glass trinkets and other knick-knacks. 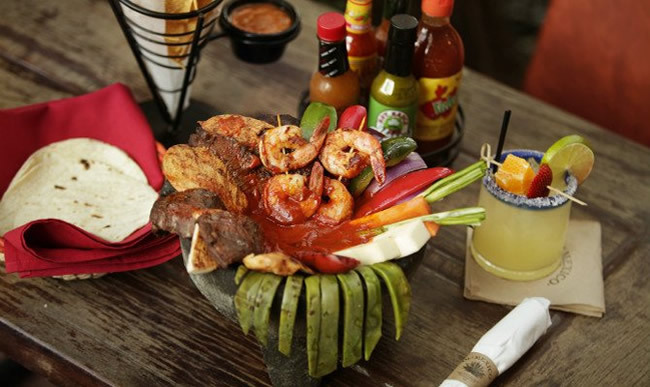 We ordered the Molcajete, a lava rock bowl filled with Mexican guajillo sauce (or green tomatillo sauce,) nopal (cactus), onion, bell pepper, Mexican cheese, and chorizo, with chicken, steak, and shrimp. It was garlicky and delicious – I even had leftovers to take to the beach the next day. At $36, it’s a bit pricey, but those are the brakes when you’re on vacation, especially in South Beach. We also had the pork chop lunch special, chuletas de puerco en salsa chipotle, which were smoked chops smothered in mild and chipotle sauce. We went for lunch, which I would recommend over dinner—then again, we didn’t try their margaritas, so the choice is yours. Were there lame people in stupid visors and puka shell necklaces sitting at tables across the way? Yeah. Did they scream “Oh my gawwwdd!” when a guy rode by on a bike with a monkey perched on the handlebars? Yes. Who cares? It’s a charming experience, and you’re on vacation, so have a nice lunch, walk down Collins Avenue, and enjoy your trip, lucky tourist!